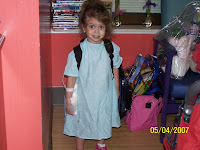 Help Cure Ana Maria: Tube Feeding Support Group! Emmy and Shey Bennett know all too well that sometimes, answers only come in the form of more questions. But after watching their 3-year-old, Ana Maria, cope with a still mysterious digestive disorder for most of her short life, the Okatie parents realize other families weathering similar health crises may find comfort knowing they don't have to keep asking those questions alone. Emmy, a 28-year-old mother of five children, is starting a Lowcountry Tube Feeding Support and Play Group, for kids like Ana Maria who can only get nutrients through a thin, hollow hose -- and for the parents trying to understand why their children are plagued with pain. Bennett came up with the idea for the group after watching Ana Maria trying to stretch her clothes to cover up the two feeding tubes that penetrate her belly. "It just hit me that she's getting to an age where she's more self-conscious, so I think it's important that she find other children like herself," Bennett said. "I know they're out there." The mother, however, is still searching for tube-fed children and their parents through Southern Mommas, a local online forum where mothers can set up play dates, ask questions of other moms and organize group meetings, like the one Bennett wants to start. "I know they need support," she said. "It's just that plain and simple. (Ana Maria) is not the only child in the area being fed that way." Bennett's 30-pound daughter is unable to consume food by mouth, and doctors across the nation still are trying to determine why -- though they've figured a rare protein allergy is part of the child's obstacle to full health, the mother said. "It's almost like your stomach and throat think you're allergic to food," Bennett said. While Ana Maria used to have a single feeding tube, she had a second one implanted on April 30. She still has severe leg and stomach pain. At the end of July, Bennett said the girl will meet renowned children's gastroenterologist Dr. Samuel Nurko at Children's Hospital Boston, where Ana Maria will undergo a scope of her stomach and small intestines. digestive system will be tested for responses to various medications and foods. After the tests in Boston are finished, the Bennetts will take their daughter to visit an allergist in Maryland before returning to Okatie. Two of my best friends have children with feeding tubes. They have talked about starting a support group network here in Michigan. Do you have a format you follow, or is it just a play date kind of thing? Meanwhile, we have started a company to try to better support children and their parents who are facing these difficult situations with medical supplies made just for them. Anyway, your input would be greatly valued. I love your website and the music. Very encouraging. God bless you and your family! Thank you.